The armor of kings and emperors was often far more ornate then typical armors of soldiers and even the armors of knights, and this Maximillan Armour is no different, possessing impressive detailing and designs that are as effective as their attractive. This suit of armour is a full body suit, in that when worn, it covers the whole body from head to toe in steel plating that looks like it would easily fend off an attack from a medieval weapon. Modeled after its namesake, this suit of armor features intricate fluting across the surface of the breastplate and back plate, as well as across the pauldrons, faulds, and the tasset plates. 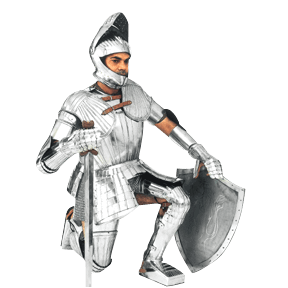 The suit of armor comes complete with everything you need to make a complete set, including a breastplate and a back plate for the torso, pauldrons, rerebraces, cowters, and gauntlets for the arms, faulds and tassets for the waist, and greaves, poleyns, cuisses and sabatons for the legs. The armor also includes a visored sallet helmet that echoes the design of the armor, featuring a fluted top and visor, as well as small cut-outs that allow the wearer to breathe easily when the visor is worn closed. Please note that this item includes only the armor and not the sword and the shield. It is worn using a series of buckles and straps that keep the armor in-place and supported across the body. 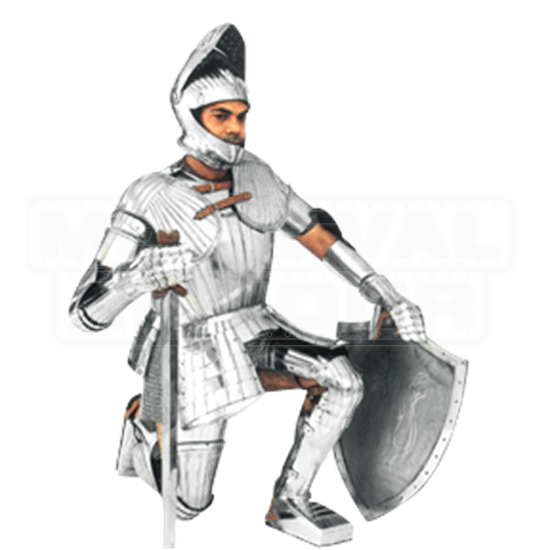 When you are really looking for that authentic look and feel of a true medieval knight, nothing works better than a good suit of plate armor, and this Maxmillan Armour is nothing if not a great suit of armor that is perfect for wearing to fairs or battles, as well as a great display to show off in your home any day of the week.